I hated the “You have to finish the box that’s already open!” rule. My mom wouldn’t buy a new box until the last one was gone, so this hack would not have been helpful for me. No kid would be eating MEGA BRAN, surreptitiously or otherwise. 2 seconds after any cake actually making it from oven or the shop to the house, it was like the Tasmanian devil’s family had arrived. My wife was less lucky. Her grandma made the best apple cake of the world, but loved baking so much that the whole family had to eat cake even for breakfast. My wife couldn’t eat a crumb of cake for years, nay decades. 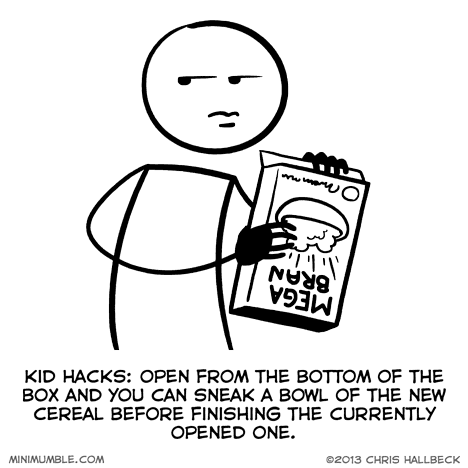 But… if you open the new cereal now, then it’ll be bad and stale by the time you finish the old cereal, so you have to sneak from the next new box. You’d be one cereal box ahead for the rest of your life! When I was a little boy, we had up to four cereal boxes. And what’s wrong with some deficit cerealling? Where else would we get the next generation of our politicians? We had that problem with bread. Mom used to cut the fresh loaf completely to slices and wondered why we used to gulp half the loaf down within two days and refused to eat it when it was a few more days old. So, it wasn’t the greatest thing since sliced bread? When I was young, we didn’t do that to get fresh cereals but to get the plastic toy.